This section of the DCAU Resource is dedicated to the series, Batman: The Brave and the Bold. Our caped crusader is teamed up with heroes from across the DC Universe, delivering nonstop action and adventures with a touch of comic relief. Blue Beetle, Green Arrow, Aquaman and countless others will get a chance to uphold justice alongside Batman. Though still based in Gotham, Batman will frequently find himself outside city limits, facing situations that are both unfamiliar and exhilarating. With formidable foes around every corner, Batman will still rely on his stealth, resourcefulness and limitless supply of cool gadgets to bring justice home. Also look for up and coming information on the newest DC Animated Universe Direct to Video Movies. Be sure to check out Series News for up to the minute information. June 23rd, 2012: Updated with 9 new images from "The Mask of Matches Malone!" - Poison Ivy, Flower Children, Catwoman, Black Orchid, Birds of Prey, Cloak of Nerfertiti, Iceberg Lounge, Georgia, and Matches Malone. November 24th, 2011: Updated with 47 new images from "Four Star Spectacular! ", "Crisis: 22,300 Miles Above Earth! ", and "Mitefall!". November 23rd, 2011: Updated with entries related to "Mitefall!". Please refer to Episode Guide entries for details on which bios were updated or added. November 21st, 2011: Updated the The Brave and The Bold Timeline with 2 entries related to "Mitefall!" in April 14, 1865 and the Present era. November 5th, 2011: Updated with entries related to "Four Star Spectacular!". Please refer to Episode Guide entries for details on which bios were updated or added. November 4th, 2011: Updated the The Brave and The Bold Timeline with 6 entries related to "Four Star Spectacular!" in World War II (1943), the Present era (4), and The Future (64th Century). October 28th, 2011: Updated with entries related to "Crisis: 22,300 Miles Above Earth!". Please refer to Episode Guide entries for details on which bios were updated or added. October 28th, 2011: Updated the The Brave and The Bold Timeline with 2 entries related to "Crisis: 22,300 Miles Above Earth!" in the present era (2). October 24th, 2011: Updated with 65 new images from "Sword of the Atom!" up to "Powerless!". October 24th, 2011: Updated with entries related to "Powerless!". Please refer to Episode Guide entries for details on which bios were updated or added. October 24th, 2011: Updated the The Brave and The Bold Timeline with 2 entries related to "Powerless!" in the present era (2). October 6th, 2011: Updated with 8 new images from "Triumvirate of Terror"; Lex Luthor (2), Cheetah, Hall of Doom, Paradise Island, Daily Planet, Steve Trevor, and Alfred Pennyworth. September 25th, 2011: Updated with 58 new images from "Joker: The Vile and The Villainous!" up to "Time Out For Vengeance!". September 22nd, 2011: Added images for Batman Revenge Squad, Hellgrammite, Cave Batman, and Creeper. June 29th, 2011: Updated with entries related to "Bold Beginnings!". Please refer to Episode Guide entries for details on which bios were updated or added. June 29th, 2011: Updated the The Brave and The Bold Timeline with 5 entries related to "Bold Beginnings!" in the present era (2), 10 years ago, near 1991, and Cold War era. June 21st, 2011: Updated with entries related to "Triumvirate of Terror!". Please refer to Episode Guide entries for details on which bios were updated or added. June 21st, 2011: Updated the The Brave and The Bold Timeline with 3 entries related to "Triumvirate of Terror!" in the present era (2) and the Future. June 14th, 2011: Updated with entries related to "Sword of the Atom!". Please refer to Episode Guide entries for details on which bios were updated or added. June 14th, 2011: Updated the The Brave and The Bold Timeline with 5 entries related to "Sword of the Atom!" in the present era (3), Post-Cold War, and 2 Years ago. June 7th, 2011: Updated with entries related to "Time Out for Vengeance!". Please refer to Episode Guide entries for details on which bios were updated or added. June 5th, 2011: Updated the The Brave and The Bold Timeline with 6 entries related to "Time Out for Vengeance!" in the present era (2), 8000 B.C., 70's B.C., 18th century A.D., and the Future. May 29th, 2011: Updated with entries related to "Scorn of the Star Sapphire!". Please refer to Episode Guide entries for details on which bios were updated or added. Images included for Javelin, Zamarons, and Star Sapphire. May 29th, 2011: Updated the The Brave and The Bold Timeline with 2 entries related to "Scorn of the Star Sapphire!" in the present era (2). April 29th, 2011: Updated with entries related to "Night of the Batmen!". Please refer to Episode Guide entries for details on which bios were updated or added. April 29th, 2011: Updated the The Brave and The Bold Timeline with 4 entries related to "Night of the Batmen!" in the present era (2) and near 1991 (2). April 22nd, 2011: Updated with entries related to "Shadow of the Bat!". Please refer to Episode Guide entries for details on which bios were updated or added. April 22nd, 2011: Updated the The Brave and The Bold Timeline with 2 entries related to "Shadow of the Bat!" in the present era and near 10 years ago. April 15th, 2011: Updated with entries related to "Joker: The Vile and The Villainous!". Please refer to Episode Guide entries for details on which bios were updated or added. April 15th, 2011: Updated the The Brave and The Bold Timeline with 3 entries related to "Joker: The Vile and The Villainous!" in the present era, 30 years ago, and 22nd century. April 8th, 2010: Updated with 128 new images from "Knights of Tomorrow!" up to "The Malicious Mr. Mind!" and "Battle of the Superheroes!". April 1st, 2011: Updated with images for Batboy, Batman (Bat-Manga), Robin (Bat-Manga), Floogle Gang, Professor Gorilla, Governor Warner, Scooby Snacks, Cosmopolis City, and Gotham City. March 25th, 2011: Updated the The Brave and The Bold Timeline with 5 entries related to "Battle of the Superheroes!" in the present era (4) and 10 years ago. February 1st, 2011: Updated with entries related to "Bat-Mite Presents: Batman's Strangest Cases!". Please refer to Episode Guide entries for details on which bios were updated or added. January 25th, 2011: Updated with entries related to "The Malicious Mr. Mind!". Please refer to Episode Guide entries for details on which bios were updated or added. January 25th, 2011: Updated the The Brave and The Bold Timeline with 4 entries related to "The Malicious Mr. Mind!" in the present era. December 6th, 2010: Updated with entries related to "Darkseid Descending!". Please refer to Episode Guide entries for details on which bios were updated or added. Images included for Ice and Martian Manhunter. December 6th, 2010: Updated the The Brave and The Bold Timeline with 3 entries related to "Darkseid Descending!" in the present era and Post-Cold War Era. November 19th, 2010: Updated the The Brave and The Bold Timeline with 2 entries related to "The Knights of Tomorrow!" in the present era. November 19th, 2010: Updated with entries related to "The Knights of Tomorrow!". Please refer to Episode Guide entries for details on which bios were updated or added. November 12th, 2010: Updated with 54 new images from "Menace of the Madniks!" up to "Knights of Tomorrow!". November 12th, 2010: Updated the The Brave and The Bold Timeline with 3 entries related to "Cry Freedom Fighters!" in the present era and 1863. November 12th, 2010: Updated with entries related to "Cry Freedom Fighters!". Please refer to Episode Guide entries for details on which bios were updated or added. November 5th, 2010: Updated the The Brave and The Bold Timeline with 4 entries related to "Plague of the Prototypes!" in the present era and World War II. November 5th, 2010: Updated with entries related to "Plague of the Prototypes!". Please refer to Episode Guide entries for details on which bios were updated or added. October 29th, 2010: Updated the The Brave and The Bold Timeline with 4 entries related to "Criss Cross Conspiracy!" in the present era, 10 years ago, and 1960's. October 29th, 2010: Updated with entries related to "The Criss Cross Conspiracy!". Please refer to Episode Guide entries for details on which bios were updated or added. October 28th, 2010: Updated the The Brave and The Bold Timeline with 3 entries related to "The Mask of Matches Malone!" in the present era and 1300's BC. October 28th, 2010: Updated with entries related to "The Mask of Matches Malone!". Please refer to Episode Guide entries for details on which bios were updated or added. October 18th, 2010: Updated the The Brave and The Bold Timeline with 3 entries related to "Emperor Joker!" in the present era and 10 years ago. October 18th, 2010: Updated with entries related to "Emperor Joker!". Please refer to Episode Guide entries for details on which bios were updated or added. October 16th, 2010: Updated the The Brave and The Bold Timeline with 8 entries related to "Menace of the Madniks!" in the present era and 2 years ago sections and 12 entries from "The Last Patrol!" in present, several years ago, and 1991. October 15th, 2010: Updated with entries related to "Menace of the Madniks!". Please refer to Episode Guide entries for details on which bios were updated or added. October 8th, 2010: Updated with 96 new images from "Gorillas in our Midst!" up to "The Last Patrol!". October 8th, 2010: Updated with entries related to "The Last Patrol!". Please refer to Episode Guide entries for details on which bios were updated or added. September 15th, 2010: Added the The Brave and The Bold Timeline. August 7th, 2010: Updated with entries related to the yet unaired "The Siege of Starro!" Part One and Part Two. Please refer to Episode Guide entries for details on which bios were updated or added. May 31st, 2010: Part Two of Two of an update to the biographies related to "Requiem for a Scarlet Speedster!." Added files for Kobra Cult, Lord Naga, Captain Boomerang, Mirror Master, The Rogues, Heat Wave, and Captain Cold in Villains, and Halo, Geo-Force, and Kid Flash in Heroes. Edited Outsiders, Black Lightning, Katana, Metamorpho, Flash Jay Garrick, Flash Barry Allen, and Weather Wizard. May 29th, 2010: Part One of Two of an update to the biographies related to "Requiem for a Scarlet Speedster!" and Episode Guide. Added files for Professor Zoom in Villains, Kali in Beasts, Giant Boomerang, Heat Gun, Cold Gun, Weather Wand, Cosmic Treadmill, and 25th Century Technology to Objects, and Central City and Flash Museum in Places. Edited Gorilla Grodd, Batmobile, and Gotham City. April 16th, 2010: Updated the biographies related to "Gorillas in Our Midst!" and Episode Guide. Added images for Killer Moth, Gorilla Boss, Monsieur Mallah, Vixen, and Dr. Milo. March 3rd, 2010: Updated the biographies related to "Chill of the Night!" and Episode Guide. February 25th, 2010: Updated the biographies related to "The Power of Shazam! ", News, and Episode Guide. February 13th, 2010: Updated the biographies related to "The Super-Batman of Planet X! ", News, and Episode Guide. February 5th, 2010: Updated the biographies related to "A Bat Divided! ", News, and Episode Guide. January 29th, 2010: Updated the biographies related to "Clash of the Metal Men! ", News, and Episode Guide. January 23rd, 2010: Updated the biographies related to "Sidekicks Assemble! ", News, and Episode Guide. January 15th, 2010: Updated the biographies related to "Aquaman's Outrageous Adventure! ", "The Golden Age of Justice!". News, and Episode Guide. January 1st, 2010: Updated the biographies related to "Revenge of the Reach! ", News, and Episode Guide. December 11th, 2009: Updated the biographies related to "Death Race to Oblivion!" and "Long Arm of the Law! ", News, and Episode Guide. November 13th, 2009: Updated the biographies related to "Inside the Outsiders! ", "Mayhem of the Music Meister! ", "The Fate of Equniox! ", and Episode Guide. October 16th, 2009: Updated the biographies related to "When OMAC Attacks!" and Episode Guide. October 15th, 2009: Updated with information on Batman: The Brave and The Bold Season One. July 24th, 2009: Show News Updated with Comic Con Spoilers. June 26th, 2009: Show News Updated. June 23rd, 2009: Updated the biographies with 55 new images from "Legends of the Dark Mite!" up to "The Last Bat on Earth!". June 19th, 2009: Updated all biographies related to "The Last Bat on Earth!" and Episode Guide. June 12th, 2009: Updated all biographies related to "Duel of the Double Crossers!" and Episode Guide. June 5th, 2009: Updated all biographies related to "Hail the Tornado Tyrant!" and Episode Guide. May 29th, 2009: Updated all biographies related to "Legends of the Dark Mite!" and Episode Guide. May 23rd, 2009: Updated the biographies with 83 new images from "Mystery in Space!" up to "The Color of Revenge!". May 22nd, 2009: Updated all biographies related to "The Color of Revenge!" and Episode Guide. May 15th, 2009: Updated all biographies related to "Menace of the Conqueror Caveman!" and Episode Guide. May 8th, 2009: Updated all biographies related to "Night of the Huntress!" and Episode Guide. April 25th, 2009: Show News Updated. March 26th, 2009: Show News Updated. March 22nd, 2009: Updated all biographies related to "Trials of the Demon!" and Episode Guide. March 16th, 2009: Updated all biographies related to "Mystery in Space!" and Episode Guide. March 9th, 2009: Updated all biographies related to "Game Over for Owlman!" and Episode Guide. March 1st, 2009: Updated all biographies related to "Deep Cover for Batman!" and Episode Guide. February 21st, 2009: Updated all biographies related to "Return of the Fearsome Fangs!" and Episode Guide. February 15th, 2009: Updated with images for biographies from "Day of the Dark Knight!" to "Journey to the Center of the Bat!" on the Batman: The Brave and the Bold. 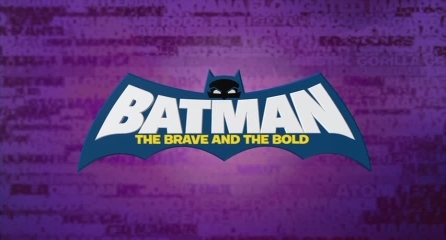 February 14th, 2009: Updated the Series News with information on the Batman: The Brave and the Bold season finale. February 8th, 2009: Updated all biographies related to "The Eyes of Despero!" and Episode Guide. February 1st, 2009: Updated all biographies related to "Journey to the Center of the Bat!" and Episode Guide. January 25th, 2009: Show News Updated. January 23rd, 2009: Updated all biographies related to "The Fall of the Blue Beetle!" and Episode Guide. January 19th, 2008: Updated all biographies related to "Dawn of the Deadman! ", episode guide, and news. January 18th, 2008: Updated all biographies related to "Enter the Outsiders!" January 17th, 2008: Updated all biographies related to "Day of the Dark Knight!" December 31st, 2008: Show News Updated. December 19th, 2008: Images added to Bios (Still missing Ulthoon, Alfred, and Sportsmaster). December 17th, 2008: Episode 3-4 Updated. Batman, Blue Beetle, Red Tornado, Sportsmaster, and Fun Haus Bios Updated. Objects, Places, Beasts, and Supporting sections Added. December 06th, 2008: Heroes Bios (G-W) Added, News Updated, and Episode 3 Updated. December 01st, 2008: Heroes Bios (A-F) Added and News Updated. November 13th, 2008: Episode 2-3, Heroes and Villains Lists Updated, and News Updated. November 02nd, 2008: Episode 1 Updated and Character Lists Updated. October 20th, 2008: Episodes 1-3 added to Episode Guide.